The feisty and fearless senator has been fighting with cancer since her announcement in 2004. Family members, Narciso Santiago and daughter in law Mechel Santiago faced the media and explained that the senator had passed away peacefully during her sleep. Despite being diagnosed with lung cancer, she was very positive that she will be cured within six months, even though her illness progressed drastically, she continued her endeavor for public service and even ran as a presidential candidate last May 2016. Unfortunately, the beloved senator did not win and only got 3% of the average national votes. She did mention prior to losing that if she doesn’t win, she will no longer work in politics and spend the remaining of her lifetime with her family. She has been a sensational influencer for the Philippine Youth, and is a true advocate for women’s rights. The Filipino youth is very close to her heart, she is in fact renown as a campus favorite, she often conducts her speeches in universities like her Alma Mater, University of the Philippines and shares not only her thoughts and experiences but also her humor which became viral. There’s no doubt that she is astounding and excellent in anything that she does – despite being known as notorious in bragging about her achievements – she had proven not only to the Filipinos but also globally, that she has the right to self-praise. Awarded with Ramon Magsaysay Award for Government service – she has served all three branches of the Philippine government – judicial, executive, and legislative, which makes her a super woman in the political realm. 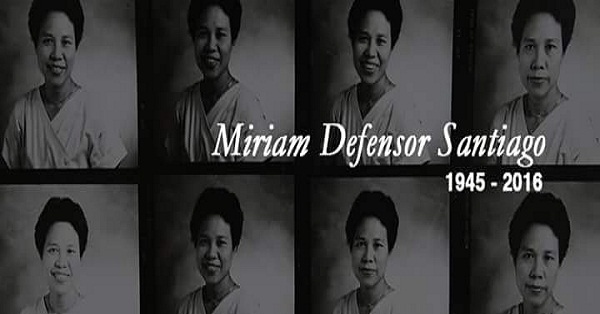 She was the First Filipina and the first Asian from a developing country to be elected as a judge of ICC (International Criminal Court), however she later resigned due to having chronic fatigue syndrome, which was later discovered to be part of her Lung Cancer. Although she is dubbed as the Ironclad Lady, she didn’t want her children to be too hard on themselves in becoming successful, but rather be happy and enjoy life, as there are many forms of success. She is definitely the epitome of inspiration and excellence of the country, and her legacy will never be forgotten.